Welcome to the Balladair website. We raise quality Bichon Frise in Regina, Saskatchewan, Canada. We have had Bichons in our home since 1983, although we did not breed our first litter until 1987. We strive to produce healthy, happy, beautiful Bichons, raised in a loving home environment. We test eyes, knees and hips to ensure our puppies are the healthiest! Balladair Bichons are winning show dogs and beloved pets across Canada and the US. The Bichon Frise is a small, sturdy, white powder puff of a dog. Its well-plumed tail is carried jauntily over the back. The Bichon's plush white coat is non-shedding, non-allergenic, and odourless. The height at the shoulder is between 9 and 12 inches, and the weight, between 10 and 15 pounds. Bichons are intelligent, playful and affectionate. A cheerful attitude is the hallmark of the breed. Up and Coming for 2004! We are proud to have been awarded the Pedigree Top Breeder award for 1996 for Bichon Frise in Canada. I'm a member of the CKC, BFCC, and BFCA. 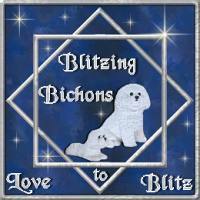 Please drop me a line if you're interested in chatting about the Bichon or would like to get more information. Want to join the Non-Sporting Group Ring?